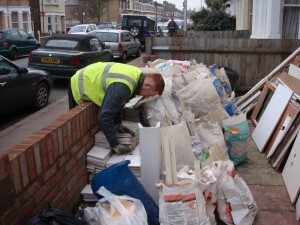 Looking for a licensed waste carrier to take away your DIY and builders waste? We have the answer. 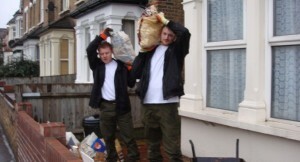 Away With It supplies builders waste removal Hackney businesses and householders can count on for quality, affordability and convenience. We’re fully licensed waste carriers, meaning you can be sure that your DIY and builders waste will be disposed of in the proper way. We also take our environmental responsibilities seriously, and work hard to recycle or reuse 80% of the waste we handle – meaning that by choosing us, you’re doing your bit to help reduce waste to landfill. We even offer a same day service too! We work right across Hackney and Dalston E8 seven days a week, from 7am till 11:30pm – meaning there’s bound to be a convenient time for us to come along and shift your DIY and builders waste. Just call us up, and we’ll give you two hour timeslot for one of our friendly, uniformed two person teams to visit your home. An hour before we’re due to arrive, we’ll give you a ring to provide a no pressure, free of charge quote. This will only take into account the amount of space your Hackney and Dalston E8 DIY and builders waste takes up in our van (keeping our prices as low as possible). If you’re happy to go ahead, we’ll come along, and get the job done. And if we need to shift waste through your home in the course of the job, we’ll use our own dustsheets and give the place a sweep too – meaning you won’t have to tidy up after us when we’ve left! Want to find out how much time, money and hassle we can save you or want to book a collection time? 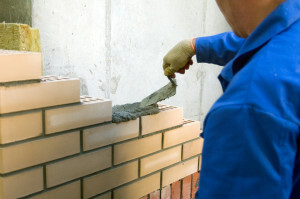 Give us a call on 0208 504 7390 or 07957 123019, and we’ll be more than happy to answer any questions and recommend the ideal builders waste removal Hackney solution for your needs. Or for a simple online quote, head over to our handy online form, fill in the details and we’ll get back to you in a flash!